Before there was the Honda Passport/Isuzu SUV, the company had a far more successful model called the Passport. 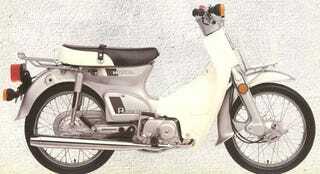 Rather than being a boring, badge-engineered truck, the C70 was an awesome little bike. Related to the Honda Super Cub, it featured a relatively powerful OHC single-cylinder four-stroke powerful enough to propel the bike to 50 MPH. The small bike was popular in the US, Canada, and especially Vietnam. A well-maintained Passport bike, with bright red-and-white paint, is arguable more valuable than the vehicle with the same name that replaced it. We'd recommend you travel to get one, but Honda cancelled their global travel in an abundance of caution Ash78 believes walks the fine ridgeline between preparedness and panic. Further Insight says it's your Civic duty to tell the Pilot if you exhibit any Element of sickness, but if you feel Fit, your Odyssey is ultimately of your own Accord.